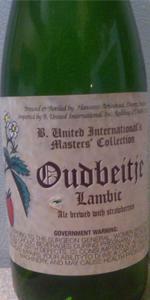 For those that like lambics, most seem to find this a quality example. I am not one of those who like lambics. And I cannot get past this pucker. Had on tap. Pours hazy, blonde in color with minimal head. Taste is strawberries, both the rind and the berry, funk, sour mix, and lemon. Really sour, light bodied, moderate carbonation. A treat. One of the better sour strawberry beers I have had in a while. Unique. It is like you are eating whole fresh strawberries right out of the patch. Well worth seeking out. 375 ml bottle into tulip glass, bottled in 1/2014. Pours fairly crystal clear golden amber color with minimal head retention or lacing. Some slight clinging bubbles on the side of the glass. Good appearance. Aromas of big tart/sour lemon, lime, strawberry, raspberry, cranberry, green apple, peach, apricot, white wine, oak, hay, straw, grass, leathery/musty funk, wheat, cracker, slight white vinegar, and yeast/oak earthiness. Very nice aromas with good balance and complexity of fruity/funky/acidic yeast, strawberries, oak, and light-moderate pale malt notes; with great strength. Taste of big tart/sour lemon, lime, strawberry, raspberry, cranberry, green apple, peach, apricot, white wine, oak, hay, straw, grass, leathery/musty funk, wheat, cracker, slight white vinegar, and yeast/oak earthiness. Moderate fruity/lactic sourness and light oak spice/fruit tang on the finish. Lingering notes of sour lemon, lime, strawberry, raspberry, cranberry, green apple, peach, apricot, white wine, oak, hay, straw, grass, leathery/musty funk, wheat, cracker, light vinegar, and yeast/oak earthiness on the finish for a while. Very nice complexity, robustness, and balance of fruity/funky/acidic yeast, strawberries, oak, and light-moderate pale malt flavors; with a nice malt/sourness balance. Increasingly puckering and drying, but not overly astringent on sourness. Minimal carbonation and light-medium body; with a smooth, acidic/grainy, and lightly tangy/tannic balanced mouthfeel that is nice. Zero warming alcohol as expected of 6%. Overall this is a very nice fruit lambic. All around nice complexity, robustness, and balance of fruity/funky/acidic yeast, strawberries, oak, and light-moderate pale malt flavors; very smooth and easy to drink; despite the increasingly lactic/drying finish and minimal carbonation. Classic Hanssens wild funk with a nice helping of juicy strawberries and oak; with a solid malt backbone. A very enjoyable offering, and spot on style example. Golden colour, no head at all and of course no lace. Aroma is funk, strawberries, wood, spiderweb, vinegar. Watery body, olily, no carbonation. Taste of acetone, vinegar, faint strawberries. Freshnes date is 2027, but sure seems to be in bad state, the acetones notes speaks louder than words. And completely flat. Guess I could use it for cooking something of as salad dressing. Look: No head, orange hazy body. Smell: Strawberry, barnyard funk, lemon, orange. Feel: Little to no carbonation, medium-light body, not that sour upfront by really acidic finish. I spent $14 for this 375 ml bottle, and the beer is completely flat. I'm usually a pretty easy grader, but I hate buying flat beer, and I really hate spending this much money on flat beer. If this beer was even lightly carbonated, it might actually be OK, but it sucked because it was flat.